Fred ‘s (guitar, percussion, vocals) musical debut occurred on the floor of his parents’ kitchen, surrounded by pots and pans, long before he ever heard of Ginger Baker or Gene Krupa. For the most recent 30 years he has been performing and recording oldtime, string band, hillbilly, rockabilly, blues, bluegrass, jazz, swing, minstrels, ragtime and Americana music. 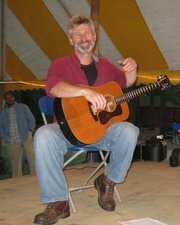 His trio, Waxlips, made award winning waves in North Carolina in the mid-80’s and he was a founding member the popular Pennsylvania-based contradance band, Dr. Twamley’s Audio Snakes, and the Celtic band Culture Clash. He presently works with Maine conflagrations Frigate, Catharsis, Hay 44, Bondeaux Redux, Improvox, and The Montville Project.